A few hiccups aside, Lottoz is off to a very promising start. Lottoz is a new lottery agent that allows players to participate in several popular lotteries from around the world. It works just like any other lottery site that came before it, so there’s isn’t really much of a learning curve. If you do need some guidance, there are some great resource materials that can get you up and running in no time. Other notable features include: free lines and other ongoing promos; easy prize claiming; tight security measures; and even several features—like deposit limits—that help cultivate responsible gambling. There’s a solid lottery experience here for sure. But as a relatively new lottery site, there are some obvious growing pains. Lottoz’s game collection is quite decent, but it’s a bit lacking compared to other lottery sites. Currently, you can play with 17 different games. Sure, that’s nothing compared to online lottery leader theLotter’s huge game collection, but it’s still a decent number. Most importantly, the games on offer here are some of the most popular ones from different corners of the world. You can join games that hail from the US, Australia, UK and even Brazil! An important caveat: Lottoz’s UK site currently only offers 15 games. Their selection is more or less identical to both the international site and Ireland site, with the exception of two games that are missing: National Lottery and UK Thunderball. Another caveat is that Lottoz only offers solo play games. As such, don’t expect syndicate games, raffles, virtual scratch cards, video slots or instant win games here. That said, if you take a close look at their Terms and Conditions, it seems they’ve already begun laying the groundwork for syndicates. You can let them know you intend to purchase tickets as a syndicate, but that’s about it. Full implementation of a group play system is still in the works, it seems. 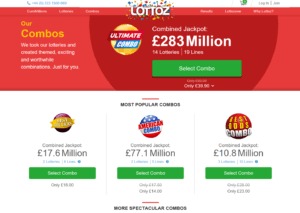 As further proof that they are continuously improving their service, Lottoz has recently launched a new feature in the form of combos. Basically, each combo is treated as a single product that contains multiple entries to at least 2 different lottery games. Each combo sports a different theme, and each of the games are handpicked so they fit each theme appropriately. For example, the American Combo offers entries to the US Powerball and Mega Millions lotteries. As of this writing, they have a total of 6 different combos. Lottoz stumbles a bit as far as their accepted payment methods go. There’s also some interesting tidbits about their withdrawal process that you should take note of. As of this writing, they only accept 3 payment methods—Visa, MasterCard and Maestro. This may not be much of an issue for some as these are quite popular payment methods, but more options are always better. As for withdrawals, you’re limited to the same three payment methods. However, which of these you can use depends largely on what payment method you used to deposit funds. For instance, if you used Maestro to add funds into your account, that’s what you will also use for withdrawals. Speaking of withdrawals, take note that Lottoz imposes a minimum withdrawal amount of €20 (or whatever the equivalent is in another currency). You can request for a withdrawal at any time, but payments aren’t guaranteed to be instantaneous. They are, however, guaranteed to arrive within 10 business days of your original request. Here’s a bit of good news: Lottoz does not charge commissions from your winnings—which is great. However, there’s a small catch: there’s a possibility that you may incur extra charges if you choose to convert your winnings to another currency. Not a big deal—and not that unusual, to be honest. No need to worry about your data—Lottoz is guaranteed safe. Lottoz, for starters, uses Norton SSL to secure data going in and out of their website. This ensures that your credit card details don’t just fall into the wrong hands. Beyond that, Lottoz is regulated by the UK Gambling Commission (for the UK and Ireland sites) and the Malta Gaming Authority (for the international site). This means that they abide by strict gaming standards and are, more importantly, not a shady website out to scam unwitting lotto players. Lottoz’s customer support options are decent—but could be better. Let’s talk about their FAQs to start with. For the most part, it accomplishes the basics. That is, it discusses the most basic queries. However, it only scratches the surface and, as a result, some crucial information is left out. 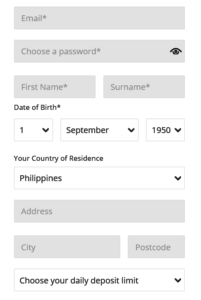 For instance, the FAQ doesn’t cover the available payment methods. It also doesn’t really explain how winners are notified (whether via email, SMS or other method)—I had to rummage through their Terms & Conditions page just to find out what I was looking for. The good news is their live support is quite good. If you want to get in touch with their support agents, Lottoz offers direct email support, as well as through an online contact form. Over on their UK and Ireland sites, they also offer live chat, though it’s not 24/7. Plus, they also have phone support. Alternatively, you can also get in touch with them via their social media accounts on Facebook or Twitter—whether you are using the international or European sites. Lottery education is one of the areas where Lottoz shines. Lottoz’s educational materials are one of its strengths. Lottoz peppers each lottery game page with dollops of helpful and interesting facts about each game. You can, for instance, learn the basics about a lottery; the odds of winning; the latest hot and cold numbers; and even the latest news. Their lottery education materials aren’t as comprehensive as other sites, but for a relatively new lottery site, Lottoz’s is impressive. It can only get better from here. 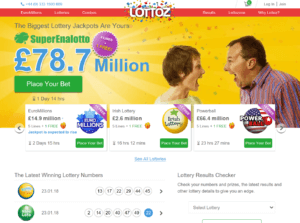 Lottoz’s website is very simple and easy to use. Lottoz’s website doesn’t stray far from the norm. It’s clean, simple to understand, and just a breeze to navigate. 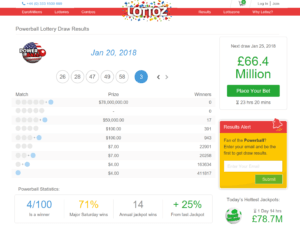 Upon landing on their front page, you can immediately get a glimpse of the latest lottery jackpots, their draw dates, and the latest winning numbers. Finding the lottery games is an easy task as well. After all, they only have solo play games on tap, so it’s not like you need to rummage through several links to find them. Playing is similarly straightforward, too. Overall, there’s no major flaw that would detract from your experience here. I just wish you could pick the number of draws when you’re picking your numbers, not after. It’s a very minor gripe though. Lottoz’s free line promo gives you more incentive to play but be aware of some caveats. Currently, a few lotteries allow you to get 1 free line. The catch is you have to fulfill their requirements to be eligible for the freebie. For example, you must get 5 lines to get the 6th free in the US Powerball. While for Mega Millions, you must get 3 lines to get the 4th free. One important thing to note: which lotteries feature the “Free Line” promo differs depending on what version of Lottoz’s site you are using. So, if you are living in the UK, you may not be able to get a free US Powerball line—but may get one if you are using the international site. This isn’t really a deal-breaker though. Creating a Lottoz account is a breeze—it didn’t take more than 5 minutes of my time. Click on the “Join” link found on the top-right corner of Lottoz’s website. Fill up the registration form by providing details like: email, password, first and last names, date of birth, postcode and address. Make sure to set your daily deposit limit before moving forward. Click on the green “Create Account” button. Of course, before you play, make sure you deposit funds in your account. You can also do that upon checkout though. Lottoz doesn’t stray far from the norm, so playing online lottery here is pretty straightforward. Log in to your Lottoz account. Choose from the available lottery games. Pick your numbers. You can do this manually or have your numbers chosen automatically via the Quick Pick option. Click on the green “Add to Cart” once you are done. In the next page, you can further customize how many lines you want to enter. You can also choose how many draws you wish to participate in. Click on the green “Proceed to Secure Checkout” button to proceed. Another thing worth noting: Lottoz also allows you to subscribe to your favorite lotteries so you don’t miss any draws. Subscriptions are monthly-based and can be cancelled at any time. You can subscribe when you are picking your numbers or when you are in your shopping cart. Claiming prizes at Lottoz is a breeze—though expect to come across some minor bumps along the way. Like many good lottery sites, Lottoz offers free real-time results alerts so you can immediately know if you’ve won or not. Alternatively, you can also check your Lottoz account. In their Terms & Conditions page, they also state that you may also be contacted via another way—it’s unclear as to what they are referring to though. If you win the jackpot, Lottoz will “personally give you the great news”—which probably means they will give you a call. As for actually claiming your winnings, the process differs depending on whether you are on their European sites (UK & Ireland) or on their international .com site. Because of the lotto betting nature of the UK and IE sites—that is, no player is officially entered into a lottery game—you’re not bound by lottery rules that say you have to be present when claiming prizes. In other words, all prizes are directly deposited to your account—jackpots included. Larger prizes may take more time to process though, but waiting is preferable to, say, traveling overseas to get your prize. If you win, Lottoz will claim the prize on your behalf and deposit it to your account. In some cases—like if you win jackpots—some lottery operators will require you to claim the prizes yourself and in person. Lottoz may be promising, but they still lack features that come standard elsewhere. Choose from tons of solo play games, plus other game types as well. theLotter has the biggest lottery game collection of them all. They have 51 solo play games on tap, plus 23 syndicates and some raffles. No need to choose between only 3 payment methods. You can choose between any of the 29 accepted deposit methods to purchase tickets or add funds into your account. Price is a tad expensive though. theLotter is known in the industry for their expensive tickets—but you are paying for the service of the leading lottery site in the industry so you know you’re in good hands. Like theLottery, WinTrillions’ game variety is impressive. They have 20 solo play games, 13 syndicates, and several millionaire raffles in their collection. They accept all sorts of payment methods. WinTrillions accepts over 32 different payment methods—including the famous cryptocurrency Bitcoin. You can only purchase tickets for multiple draws. If you only wanted to participate in 1 draw per entry, WinTrillions might not be for you. They only offer multiple draw purchases. Expect good game variety here. LottoKings’ offerings are a bit similar to WinTrilions in that they also have 19 solo play games. They offer less syndicates and raffles though (only 4 each). Compared to theLotter and WinTrillions—as well as other lottery sites—LottoKings has some of the most affordable ticket prices around. They don’t offer ticket scans. Despite being a lottery agent, LottoKings does not scan your tickets for you. They do offer a purchase invoice instead. Lottoz may have some shortcomings, but they do hold tons of promise. Despite the few gripes I have about their service, it’s easy to see that there’s a solid lottery site in the making here. Lottoz is a diamond in the rough, so to speak. Sure, they may not offer a variety of game types, accept tons of payment options, nor cater to non-English speakers—but, for the most part, they do manage to offer a good core experience. You’re looking at 17 games consisting of the most popular lotteries around—plus some games not usually found in other sites. They also offer cool promos, tight security, and an easy prize claiming process. Plus, they also help people nip potential gambling addiction in the bud. Yes, Lottoz has a long way to go before besting more established lottery sites in the industry. But their service is already quite impressive this early into its life. It’s easy to see them getting better as time goes on. 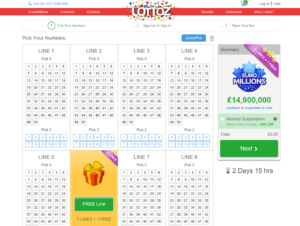 Lottoz is a relatively new lotto messenger/lotto betting site owned and operated by Morpheus Games UK. Registered in Malta and licensed and regulated by the UK Gambling Commission and the Malta Gaming Commission, it offers players a safe and legitimate way of betting on official outcomes of some of the biggest lottery games around. Hi Subash, please click on the button at the top of the review. Thanks.